I'm so happy to finally be done with the Shepherd's Harvest booklet! It's being printed now, but you can download a copy from the website. Unfortunately, Bob Padula won't be at the festival doing the micron testing this year. 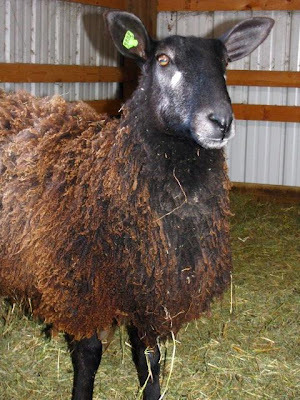 The committee members decided it would be best to wait and have him next year along with Phil Berg from the Pipestone Sheep Program. Of course I said I would like to have Bob there every year testing fleece samples, but others didn't think there would be much demand for that. Oh well, I tried and the majority rules! There are still lots of other cool things going on to draw people in to the festival. I'll send my fleece samples to Texas A & M again this year. took time out to enjoy a wonderful boiled dinner with friends last night for St. Patrick's Day. I always love St. Patrick's Day because it means spring is on the way. I'm still hoping to get my washed wool shipped out to Zeilinger's next week. And then I need to start in on skirting the 2010 fleeces. I can't wait to get a good look at them! We frost-seeded our pasture paddocks on Monday. I hope it wasn't too late in the year, but we couldn't have done it any earlier -- the snow pack just melted two days before we seeded. I had my photos put on a CD so I could share a few here. I got a new laptop yesterday rather than buy myself a new card reader for my old computer (which is almost 5 years old now). Hopefully I can get the laptop set up in the next few days. Until then, here are sheep photos from early March. Ward Harwell, what a beautiful face for a guy! Things have been so busy around here this week. We got the shearing done on Monday and all went well. I love the rythym of shearing, the sound of the clipper and the predictable, repetitive motions used to rid the sheep of their fleece. I never like to have a crowd on hand for shearing, the best times are when it's quiet, just the sound of the clippers, the smell of sheep and just Stan and I and the shearer. I make up the CDT shots ahead of time and labels for each sheep's bag of fleece. 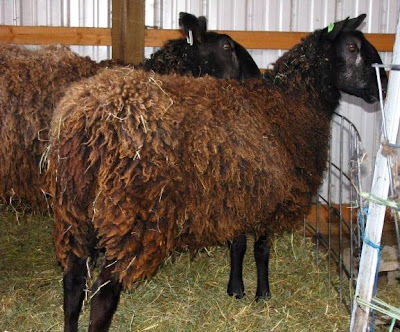 Then I just have to scoop up the fleece and put it in the bag before helping to put the naked sheep back into the pen. All the sheep are in good flesh this year. Unlike last year when I was feeding sub-par hay and they were SO horribly thin at shearing. And yes, there will be lambs as planned in April! It's always a relief to see the bags starting and the round tummies. 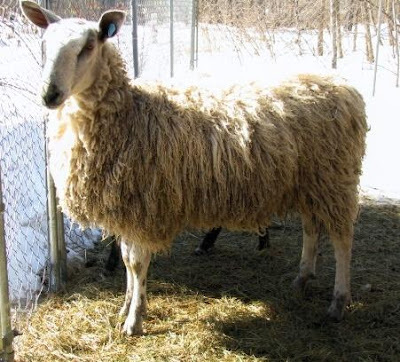 I will upload photos of the shorn sheep when time permits. I'm am working like a mad woman on the Shepherd's Harvest booklet. In fact, I've been so involved, I left poor Ozzie out in the rain overnight last night. I left the light on so I wouldn't forget he was out there, but I was so wiped out that my reminder didn't work. Bless his heart, I think he's forgiven me already. I just hope he doesn't get sick now. The booklet should be done on Monday. So you can download a copy on the Shepherd's Harvest Sheep & Wool Festival website shortly after that. The Census Bureau called the other day and I've been selected to work another detail. I'll be in training for four days next week. This time I'm not adjusting my work schedule at the deli, because I can always work those few days in while I do the census work. I have really enjoyed the census jobs I've done so far. I've met people and learned a lot about the area. It's kind of like being on a treasure hunt finding the right home and then hoping to find a person to talk to once you get there. The only thing that has me a little worried this time around is the flooding. There are so many rivers in our area and with our recent melting and rainfall, they are rising fast. I don't want to have to drive through any flooded country roads. So Many topics to cover - so little time! For a while there I had nothing to blog about, and now a million things are coming to my mind. Like our new refrigerator and my agonizing day spent trying to get through to the Minnesota Energy Star Rebate program. Luckily I got through at 8:30 p.m. and reserved my rebate funds just before all the funds ran out -- on the first day of the program! Also, we had a strange black lab decide to come to our house and stay last weekend. Our LGD Shachah was beside himself trying to get at the stray. Which made it very nervous, but it wouldn't leave our place for some reason. I couldn't let a strange dog run loose around here with our sheep and poultry, so we had to lock him in our garage while we started calling all the neighbors and the sheriff. Luckily our friend was gracious enough to house the dog while we continue to try to find his owner. We've called the vet's office and put ads on the radio and in the paper. He's a nice dog and he knows how to sit when told, so he has to belong to somebody. 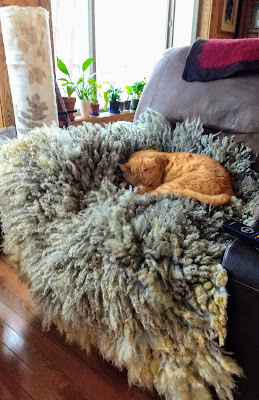 Recent blogs have inspired me to write about subjects like finding and keeping a good shearer (our shearing is scheduled for Monday), lambing in cold temps, BFL hardiness vs. Shetland hardiness, bottle babies in the house (vs. in the barn), selecting rams. Oh yes, the list of subjects I've got opinions on is suddenly quite long. But I'm going to spare you the agony of reading all that now and get to the point here because I am swamped with work and it's gorgeous outside. Another announcement regarding Shepherds Harvest is that the 2010 class schedule is now up! There may be more additions coming. 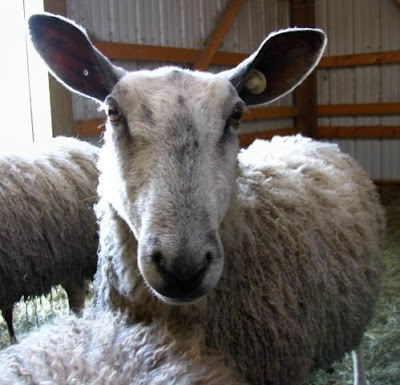 Bob Padula has agreed to come on Saturday (May 8) to do a presentation for shepherds and handspinners on wool qualities. He will have the OFDA 2000 on hand to do micron testing also. 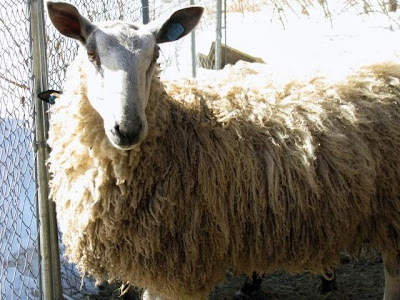 This is the same machine they use at Texas A & M, so if anyone is looking to have their flocks' wool samples micron tested, this is your chance to have it done without having to send your samples off and wait weeks for the results. The cost will be comparable -- although that information is not set in stone yet. Also, I'm excited to see the Midwest Felting Symposium class schedule has been posted. I love the atmosphere there and I'm planning to go for at least a couple days again this year. I might take the Nuno Felt- Origami folded purse class on Sunday. My friend Nancy Hoerner is taking the Creative Felt Textures class that day along with her friend Caroline. I was tempted to take that one too...but maybe Nancy and I can compare notes on the ride home.